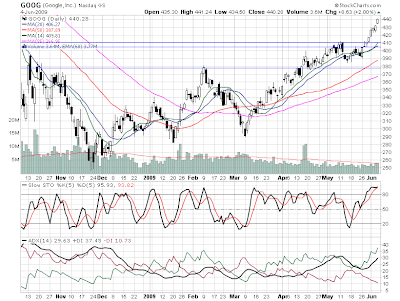 Looking to short GOOG for a consolidation trade. It is very overbought, and has had too many up days in a row. An analyst already raised target estimates, and more should follow due to the absolute bullishness, adding support to the stock. Will look to take the trade on tomorrow if GOOG raises via 450 Sept puts, but am only playing it for a few point pull back.